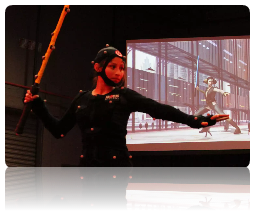 Motion Capture character animation, is the act of recording an actor's movement and applying it to a 3D character. 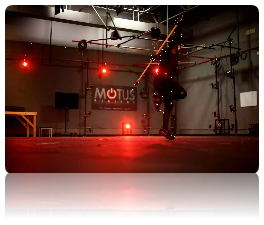 Motus does this by attaching markers to the actor's body and having them perform on a stage surrounded by Vicon motion capture cameras. When multiple cameras see the same marker, it is able to identify and record the marker's position. 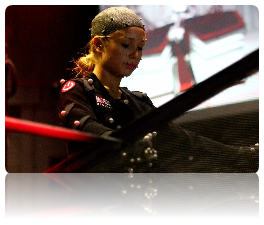 The data is recorded in Blade, known as RAW Motion Data. After the shoot, the desired takes are selected and the data is “Tracked”, producing .C3D files that are ready to be applied to the 3D character. We then use MotionBuilder to "Solve" the .C3D data to the 3D character, creating .FBX animation files. The final step is editing animations and preparing them for delivery in their final format. 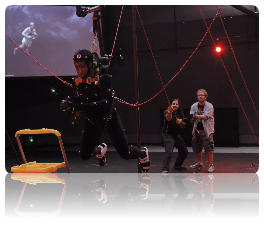 Our mocap system is sensitive enough to capture the subtleties of fingers playing violin or motions as big as 720's out of a quarter-pipe. We have experience with recording multiple actors, sports / athletic captures, combat scenes, run cycles, stairs, stunts or wire rigs. Even the occasional four-legged friend. 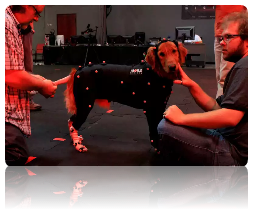 Motus utilizes real-time displays allowing the director to see a preview of the motions during the shoot. This helps the actors hit their marks and give directors an idea of how the data will look in post.